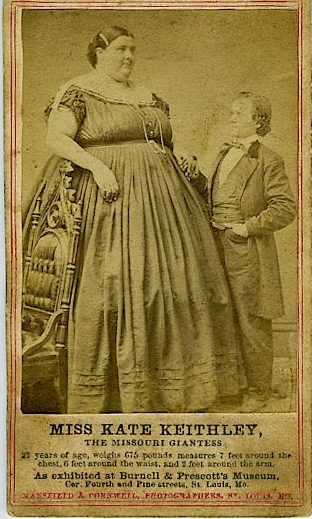 KATE KEITHLEY, Giant Lady. Carte de visite. 4 ¼” x 2 ½”. Imprinted information on bottom of mount “The Missouri Giantess…6 feet around the waist, 2 feet around the arm, 675 pounds”. Ca. 1860 -As Exhibited at Burnell & Prescott’s Museum in St.Louis,Missouri.